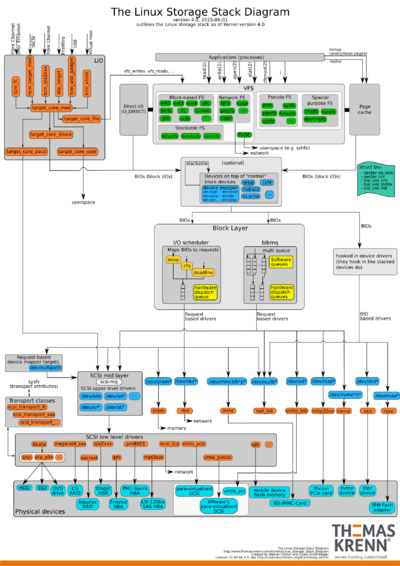 There are lots of old copies floating around from the Linux Storage Stack Diagram – Thomas-Krenn-Wiki. The above link has the up-to-date version and larger versions in PNG, SVG and PDF so be sure to check it out. The old URL was http://www.thomas-krenn.com/en/oss/linux-io-stack-diagram.html – it now redirects to the above one. This entry was posted on 2017/01/20 at 12:00	and is filed under *nix, Linux, Power User. You can follow any responses to this entry through the RSS 2.0 feed. You can leave a response, or trackback from your own site.